Dr. Martin Tajmar, Head of Space Systems Chair and Director, Institute of Aerospace Engineering, Technische Universität Dresden presents "The SpaceDrive Project: Progress in Testing and Modelling on Mach-Effect and EMDrive Thrusters." Session 4 of The Advanced Propulsion Workshop held November 1st - 3rd 2017 at the Aerospace Corporation in El Segundo, California. The SpaceDrive Project – Developing Revolutionary Propulsion at TU DresdenMartin Tajmar*, Matthias Kößling, Marcel Weikert, Maxime Monette; PDF. I saw all these project views from Tajmar et al..
Is there a form of "pumping" goin on in the frustrum? 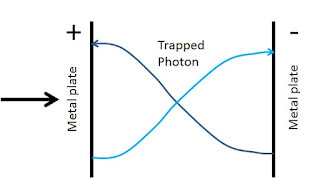 Like in a maser where exited atoms collide with photons and produce a another photon that has the same wavelenght and polarisation and phase and fall back to the old state and so forth . Im curious about whats happening INSIDE the frustrum and if the same effect (thrust) can be achieved with a tapered solid state maser. Hard to answer without a confirmed theory. What would be the expected for the thrust of a solid state maser, or why not a gas maser ? It seems the energetic efficiency and density is very low compared to a magnetron? A solid state maser might not have the same amount of thrust as an conventional microwave, but its very stable and works around 1.45 gigahertz. The Purcell factor is also more controllable. The transmitter in the frustrum disturbs the overall effect more or less. (in the new verson of the EMDrive Shawyer incorporated a small guiding antenna in the frustrum, to prevent distorting, so it looks Shawyer tries to pinpoint the waves) A gas maser is also more fragile and works around 24 gigahertz. The microwave used in the original EM Drive include the entire SHF band but a whide range of frequenties is much harder to controll and to measure than a solid state maser. Gamma rays have a very small bandwidth, as you the waves need need more or less reflection to work, it seems tha a force created by such small waves will create less atomic pressude on the big frustrum end than electromagnetic waves. In the EM drive, the rather big size and spacing of the copper atoms prevents the EM waves to escape to the outside of the frustrum. The key is to reflex the waves, to enable thrust, not to let the wave bounce right trought the copper. The post was edited 2 times, last by Willem Staal ( Feb 26th 2018, 10:41am ). as you can see the upper drawing is a theoretical attempt to illustrate whats going on in a frustrum. As you can see there are lots of harmonishes what might effect te result. Dont forget that imperfections in the frustrum and dimensions of the tapering WILL affect te thrust especially in a handmade build device. Its more like a musical instrument, why sounds a stradivarius so much better than a kids violin? I think the dimensions that enables the wave to produce any thrust must be very precise. I notised that the original Em drive that shawyer build had a sort of adjustment bolts attached to the endplates. It looks like he had to hone the end segments accordingly..
Thats why i am favoring a solid state maser unit with a tapered shape. These waves are coherent and can be better controlled (electronic wave triggering) than with nuts and bolts. Yes, standing waves, but electrons and positrons are made up of standing waves as in R.C. Jennison Phase-locked cavities. Shawyer made his second generation Em drive with a superconducting end plate. It seems that he uses electrons to transport a form of inertion trough the Big endplate. A ceramic superconductor make use of cooper pairs to pass electrons by using phonons to transmit electron movement. This might be occuring in the em drive endplates as well. there is lots to discover about this, thats for sure. 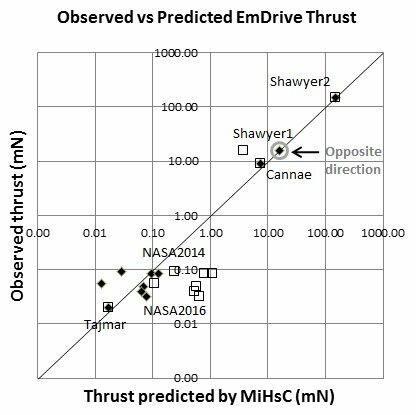 interesting too see that a few predictions (black diamonds) versus observed thrust (square boxes )of the cannae drive and Shawyer 2 are spot on. No predictions of the still theoretical Shawyer 3 that claims to be 1.54kN/kWm. The question is; Has someone build a third gen. drive already?